Check out the designer sale at Germany-based Mytheresa.com! Their prices are VAT included. If you have it shipped into the US, you will not pay VAT, but you will have to pay duty, which adds back to about the same price listed on their website. Miu Miu Red Patent Pumps from 290 to 175 Euro (approx. $271), another red shoe! YSL Stone-Detail Chemise Dress from 1950 to 1365 Euro (approx. $2115), this was worn by Carrie in the SATC movie. or using the ShoppingNotes bookmarklet following these instructions (or refer to the step-by-step illustrations I’ve written for Firefox and IE). Bottega Veneta’s online private sale starts. I didn’t see anything particularly interesting from the listed sale items. 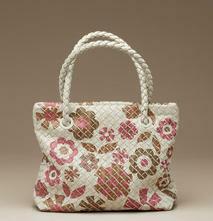 But there’s a Kawaii print tote I loved from their summer catalog, it’s so sweet and summer-like. I’m going to find out whether it’s also on sale. Also looks like Net-A-Porter adjusted sale prices on some items by $0.50, what’s up with that?? Like this Proenza Schouler Bustier Dress, it was $1396.00 when sale started, now it’s $1396.50. On the other hand, those Miu Miu Flower Motif Flats, went from $338.00 (sale price) to $337.50. If this was due to change in currency exchange rates, shouldn’t them all go down by $0.50 or all go up by $0.50?